* Would you like the bear to have a hood that matches the degree hood? Gown: Black, Cambridge-style, with open sleeves. Hood: Black, Oxford-style, lined with Blue. This is unique, degree-specific (Standard) item. Suitable for those who have completed a Bachelor degree in Standard at James Cook University. See the 'Sizing Guide' tab to choose the appropriate size of gown and cap. The hood is a standard size. Gown: Simply use your height, measured in the normal way. This will ensure that you get a gown that falls around half-way between your knees and your ankles. 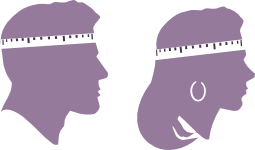 Cap: Measure your head circumference at the widest point (a few centimetres above your eyebrows is normally a good level to measure). Be sure to include hair, including pony-tails, in the measurement. If you are on the borderline between two sizes, it is best to pick the larger of the two. The best method is to use a measuring tape. Don't have one? No worries! We've made one for you to print out - download the GownTown DIY measuring tape here. You can also use a piece of string or cord and then measure the length with a normal ruler.